I realized as I’m writing my newsletter to go out later tonight (or tomorrow), that I haven’t posted photos of the Christmas quilts I made for my family. Oops! Here they are. I made each of my nieces a quilt. 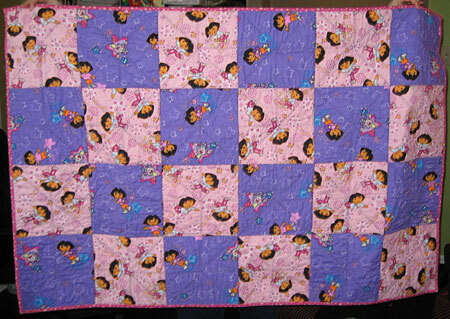 Dora for Lucy and Elmo for baby Alice. While these aren’t great works of art, they are made with lots of love, and I hope they’ll treasure them during their toddler years. They both have warm and cozy flannel on the back. 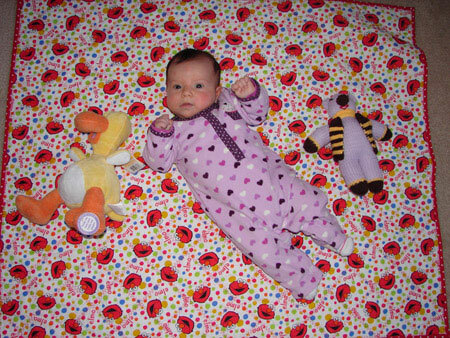 My sister sent me the photos of both girls using their quilts (which I love, thanks sis). 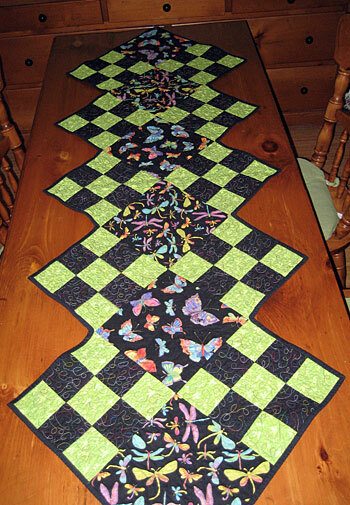 For my folks, I made them a table runner that I designed and called Fluttering Wings. Binding the inside corners turned out to be quite the ordeal. If anyone has advice, I’d love to hear it. I got it done, but they could use some improvements. 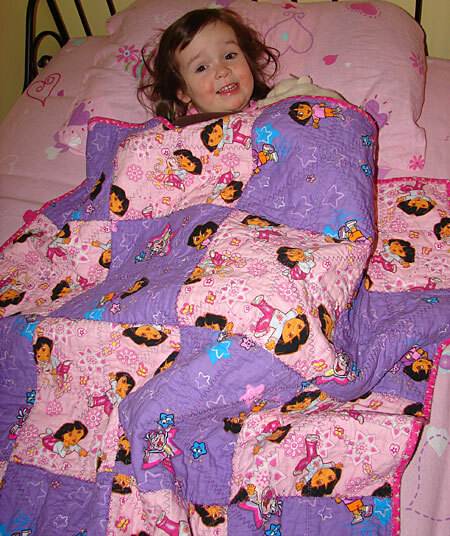 Those quilts are just adorable and they are “works of art”!! I do love the tablerunner also. Having made a scallop binding on a mini of mine I understand your frustration on the binding of the inside “v”, but it looks great ! No one will ever see them the same way you do! They are all full of love! My inside corners are just beautiful, and need no improvements what so ever! We love it, and wouldn’t change a thing! Wow, binding inside-corners…that’s a real b– I mean “Challenge”… Haven’t tried that one yet. Yes, there is a trick to it, but it’s been a long time since I tried anything close to it. Sounds like “Mom” is happy with the results, though! One way round the inside corner problem is not to bind at all, but to use a facing (as in dressmaking) on the back. It’s one way to finish the edge of anything that isn’t a regular shape. 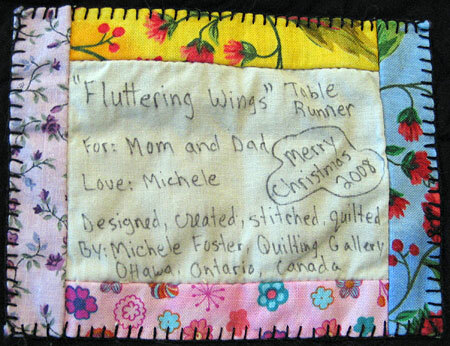 The quilts and table runner are fantastic! They are truly one of a kind gifts that were made with love and will be treasured. Great job and thank you for sharing! So nice to see al the pictures! 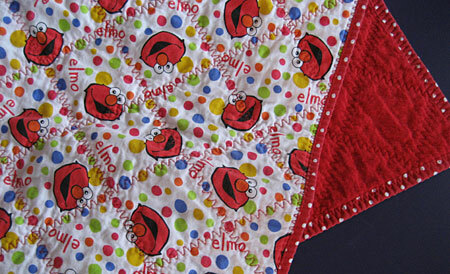 Love the table runner and where did you find Elmo fabric. I know a little boy who’s Elmo crazy.